IBM® Coach Framework is a key component of the IBM Business Process Manager (BPM) platform that enables custom user interfaces to be easily embedded within business process solutions. Developer tools enable process authors to rapidly create a compelling user experience (UI) that can be delivered to desktop and mobile devices. IBM Process Portal, used by business operations to access, execute, and manage tasks, is entirely coach-based and can easily be configured and styled. A corporate look and feel can be defined using a graphical theme editor and applied consistently across all process applications. The process federation capability enables business users to access and execute all their tasks using a single UI without being aware of the implementation or origin. Using Coach Framework, you can embed coach-based UI in other web applications, develop BPM UI using alternative UI technology, and create mobile applications for off-line working. This IBM Redbooks® publication explains how to fully benefit from the power of the Coach Framework. 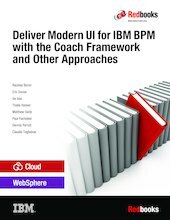 It focuses on the capabilities that Coach Framework delivers with IBM BPM version 8.5.7. The content of this document, though, is also pertinent to future versions of the application.